Ashwaq Basnawi is a third year PhD student in the University of Liverpool’s Department of English. 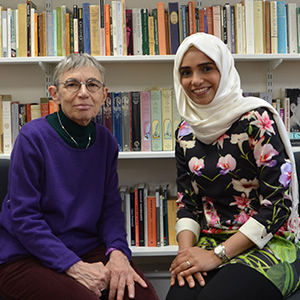 Her research explores how the poetics of Marilyn Hacker’s later poetry are shaped by her translations, intertextual literary references, and intersubjective relationships between self and other. Marilyn Hacker is a contemporary award-winning American poet, renowned editor, literary formalist, political activist, feminist, translator, book reviewer, and critic. She is a prolific writer: author of fourteen books of poems, fifteen volumes of translations, and one essay collection. Her importance as a contemporary American woman poet comes from belonging to a poetic tradition that reaches back through W.H. Auden, James Wright, and Adrienne Rich, among others. Hacker’s work affirms and reinforces the traditional poetic heritage and uses it as an instrument to call for political and personal redefinition. In the past fifteen years, however, scholarly attention paid to her poetic work has mainly focused on her early collections written at the end of the twentieth century; to date, there has been no attempt at an extended examination of her post-1994 literary production which include translations from French and Arabic to English, new twenty-first century poetry collections, an essay collection, and a cross-cultural poetry collaboration. Most importantly, there is a shift in attention in her later poetry that has not been explored. Increasingly, her feminist poetics has turned to issues of memory and history, home and exile, mortality, and the pain and suffering of the political other. In my interview with Hacker for the University of Liverpool’s Centre for New and International Writing, she describes this transition: ‘one hopes one becomes more aware of more things as one grows older, [specifically] the experiences of people other than oneself and being able to juxtapose them and think about them in some kind of coherent way, and being the same and being different and going beyond [one’s self]’. Hacker’s voluntary expatriation to Paris since the early 1980s has allowed her more access to the different diasporic narratives of poets living in exile and political refugees. As her poetry becomes more intertwined with the narratives of the Arab diaspora, Hacker is better able to examine her position as a North American woman writer in relation to her heritage, her sense of exile, and the political situation in the Middle East. Examination of the trajectory of Hacker’s work reveals a consciously constructed palimpsest of previous and current poets’ work. Hacker invites her readers to read through her writing to previously absorbed texts and thematic parallels. The effect is a cross-cultural metaphorical palimpsest that connects past with present and allows for the continuous reinscription of the self through poetic form. I am focusing in my work on Hacker’s poetic work after 1994 from her first translation from the French, Edge (1996), to her own work and present-day translations. I believe that her translation choices rely, mostly, on poetry that deals with personal memory inflected by collective history, written in a lyric narrative that memorializes these experiences. Translation immerses her deeply into different poetic traditions and forms and, consequently, shapes her aesthetic inclinations. I am examining the complex literary references that exist between Hacker’s Squares and Courtyards and her translations: Claire Malroux’s A Long Gone Sun and Venus Khoury-Ghata’s Here There was Once a Country, all of which were published in 2001. She creates a poetic palimpsest using these literary relationships that connect her poetry to that of other writers, so that she in turn is able to connect to both her past and present selves through writing. Focusing on her thirteenth book Diaspo/Renga (2014), I will explore how Hacker selects an eastern collaborative poetic form, the renga, to engage in a two-way conversation about political narratives of the Middle East and articulations of exile and displacement. Using literary references and poetic form, Hacker creates an intersubjective, shared third space from a relational, two-person subject-to-subject mediation between the self and the other. This non-linear, continuous process signifies the movement of the palimpsest across people, borders, cultures, and generations. Hacker calls this interpersonal process a ‘current of poetic colloquy’ when she engages with the poetic traditions and narratives of other writers to develop her own poetic forms and themes. Studying the diverse and multilayered poetry of Hacker has given me the chance to understand how poetry is used in different poetic traditions to communicate and converse with other writers and cultures. 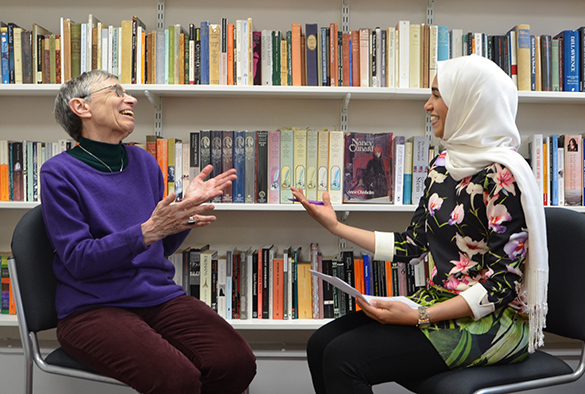 Marilyn Hacker read some of her latest work as part of the University’s Miriam Allott Visiting Writers Public Lecture Series at the School of the Arts Library. A recording of this poetry reading can be found here.